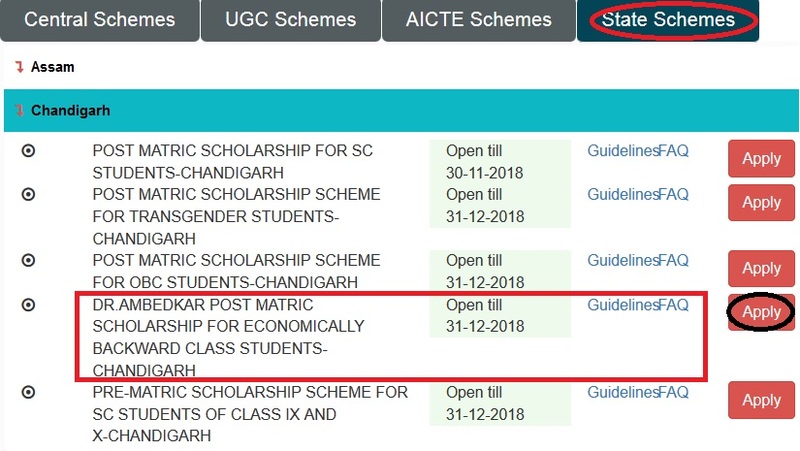 Dr. Ambedkar Post Matric Scholarship For EBC Students Chandigarh for the year 2018-19. The objective of the scheme is to provide financial assistance to the Economically Backward Class (EBC) students studying at post-matriculation or post-secondary stage to enable them to complete their education. i. The scholarships will be open to Indian nationals belonging to General Category (Other than SC, ST and OBC) and the total income from all sources of the employed candidate or his/her parents/guardians in case of unemployed candidate shall not exceed Rs.1.00 lakh per annum. ii. Candidates who, after passing one stage of education, are studying in the same stage of education in different subject e.g. I. Sc. after I.A or B.Com. after B.A. or M.A. in a subject after M.A in another subject will not be eligible. Scholarships shall not be awarded for training courses like Aircraft Maintenance Engineer’s Course and Private Pilot License Courses. Courses at Training-Ship Dufferin (Now Rejendra); Courses of training at the Military College, Dehradun, Courses at pre-examination Training Centres of All India and State levels. iv. Students who, after having completed their educational career in one professional line, e.g., LLB after B.T/B. Ed will not be eligible. v. Students pursuing Post-graduate courses in medicine will be eligible if they are not allowed to practice during the period of their course. Step 3 : After that Click Apply link in the “Dr. Ambedkar Post Matric Scholarship For EBC Students” under Chandigarh. a. One copy of the application for scholarship in the prescribed form (separate application form may be prescribed by concerned State Government/UT for ‘fresh’ and ‘renewal’ scholarship). d. A certificate (in original) of income issued by an authorized Revenue Officer not below the rank of Tehsildar. e. A receipt in acknowledgement of the scholarship in the previous year on the form attached to the application only duly countersigned by the Head of the Institution concerned, if the applicant was in receipt of a scholarship under this Scheme in the preceding year.